Skip Hire Westhoughton offers skips ranging from 2 to 40 cubic yards; we can supply lock-able skips for hire as required. Our office has constant radio contact with our drivers to ensure first-class efficiency throughout all of the Westhoughton area. Our vehicles are maintained to the highest standards for skip hire in and around Westhoughton. They are inspected daily and serviced every six weeks by our workshop to ensure that they are kept road-worthy, perfect for skip hire distribution, and are pollution free. We always provide a friendly, efficient skip hire service that is second to none in Westhoughton, and look forward to being of service. 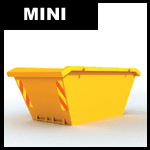 We can provide lidded and lockable hire skips for undesirable areas, shopping centres or anywhere the situation arises, within Westhoughton. We can arrange skip hire for members of the public in Westhoughton, who can conveniently pay by credit card through our office to alleviate having to pay cash on delivery. Skip Hire Westhoughton, Wigan Road. Westhoughton, Bolton BL5 2BX.